But perhaps not in the way you’d think. 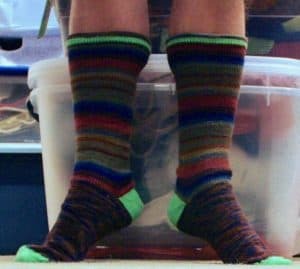 I’m back cranking socks on my Circular Sock Machine (CSM) and enjoying the results. 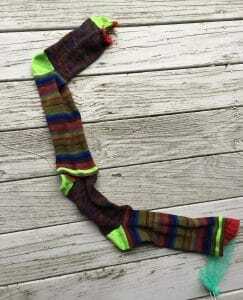 I’m re-acquainting myself with the sock knitting machine. It has been both frustrating at times and challenging and enjoyable. I first confirmed the machine was back in full working order. I then decided to try and make my standard 1×1 ribbed sock. The standard recipe is done cuff-down and the ribbing on the underside of the foot stops a few rounds short of the heel shaping. I also do the heel and toe in a way that makes for a more rounded toe/heel without dog-ears. This method requires that I work a short-row heel on the machine with the ribber-plate in place. You can see the ribber-plate restricts my ability to see if I’ve dropped a stitch during the tricky maneuver of doing short rows. Surprisingly, the first sock came out pretty well. It’s possibly salvageable with some hand-knitting/fixing. 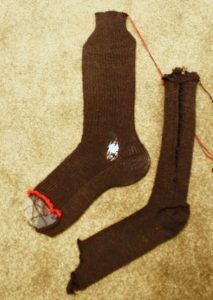 The second sock was more of a mess and would require significant salvaging and hand knitting of the toe. Last night I dreamt cranking out ribbed tubing on the machine. I inserted some waste yarn where the heel and toe would be knit. I was going to hand-knit after-thought heels and toes. 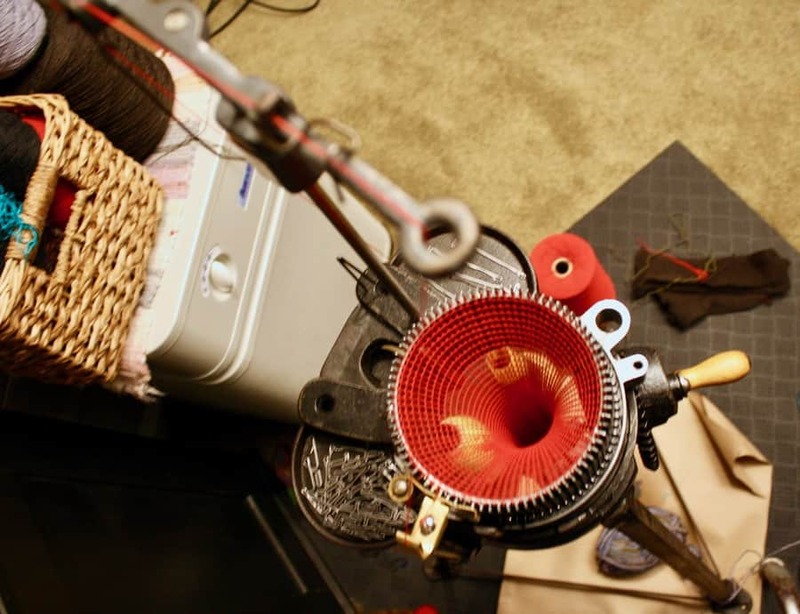 It would work, but kind of take away the challenge of knitting a fully made sock all on a 100 year old machine. 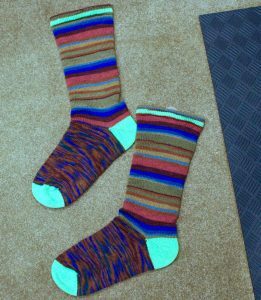 Instead, I decided to attempt a more simple pair of socks and ended up making something that is quite acceptable for wearing! 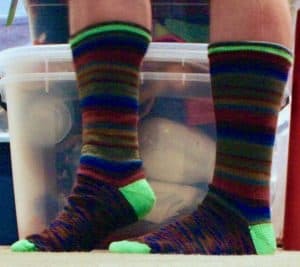 The one brave attempt was the contrasting colors for the hem, the toes and the heels, done with Gnomespun’s neon green sock yarn (I did transfer it to a cone before using it). So after cranking out a tube with strategically placed hung-hems, heels and toes, I removed all waste yarn and grafted the toes with Kitchener stitch. They’re a little larger than I’d prefer for everyday wear, but overall, I’m quite pleased. 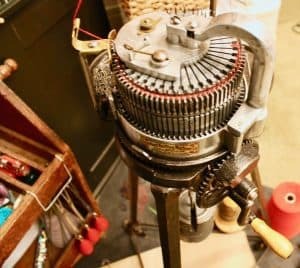 I may just need to use a technique of turning the heel without the ribber plate on. My machine and my skills are a bit too lacking. I think I need to see my heels being made be able to fix mistakes quickly. These are so lovely. Thank you so much for posting. Might I ask what cylinder size you did these on? 1×1 20 row cuff, 3×1 ribbed leg and pre-heel. Ribbing our of work but in place. Heel. Ribbing back in work with ribbing ontop and on the bottom of the Foot. Pre-toe ribbing removed (a knit row). Cast off? 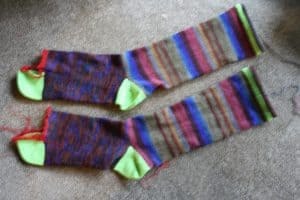 The finished socks are no-rib, hung-hem cuff on an 80 needle cylinder. My standard rib sock is cuff-down 1×1 ribbing, to pre-heel rounds (3 rounds), where I transfer the heel stitches from ribber to cylinder and leave the other half on the ribber and work 3 rounds before putting the ribber into selvedge mode and raise the cylinder needles on the side still being ribbed out of work. Make the heel with the ribber plate still on. Work the foot and then transfer remaining ribber stitches to cylinder, work one round plain and then work toe. 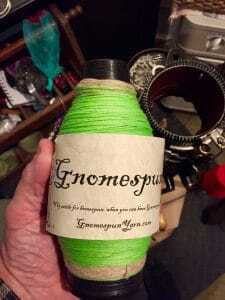 I finish with waste yarn and grafting of the toe. It must be only me. Nothing came through on email from your blog but I don’t see any other comments about it but mine! Not to worry, I’ll just keep checking back here as always. Hi Joe! Would it be possible to put your cell phone under the sock machine and videotape while you crank? You might be able to see what’s happening that way. Happy almost New Year! Thanks Daisy. I have worked with some of the expert CSM people and video’ed the cranking so they could try and help trouble shoot. Fortunately, I think I have everything tuned and balanced.